Last week I was trying to decide on a venue for my birthday drinks (which were on Friday but I won't blog about that night as the event did not involve much in the way of food, just many, many gin and tonics plus a bizarre wasabi-spiked Bloody Mary I will never let James buy for me EVER again). 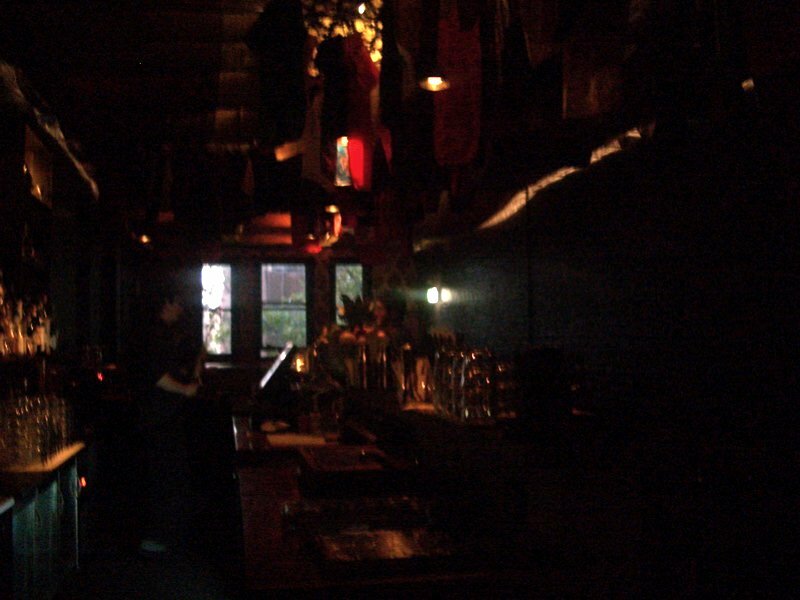 Before Christmas, best-friend-K and I had been planning on visiting Seamstress as one of her colleagues had been raving about it, but what with the Yuletide whirlwind we didn't manage it, and then they were closed for two weeks. 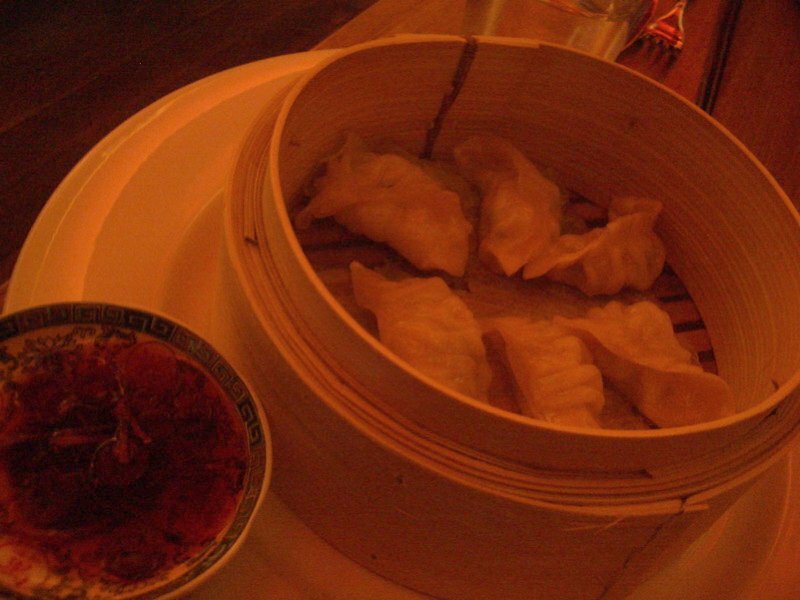 But last Tuesday, we visited Seamstress to (a) sample the Cantonese cuisine Agnes reviewed, and (b) check out the upstairs cocktail bar as a potential birthday drinks venue. 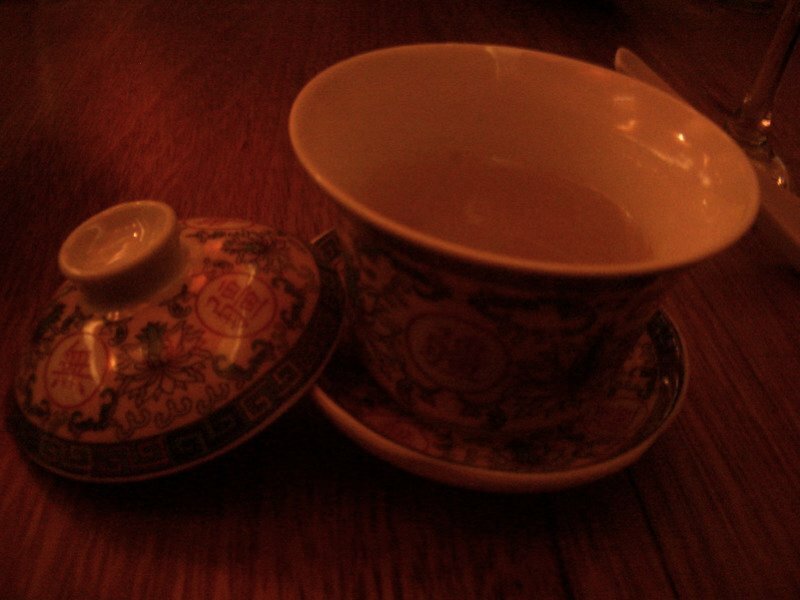 Before our entrees arrived we were given little bowls of simple but nourishing broth as an appetiser. Like a fool, I didn't jot down the names of what we had, so I've discussed it this evening with K but forgive me if I get any details wrong. These are the Tailor Dumplings, which had a prawn (and possibly also crab) filling. They were exquisite - the casing was silky and the dipping sauce particularly good. 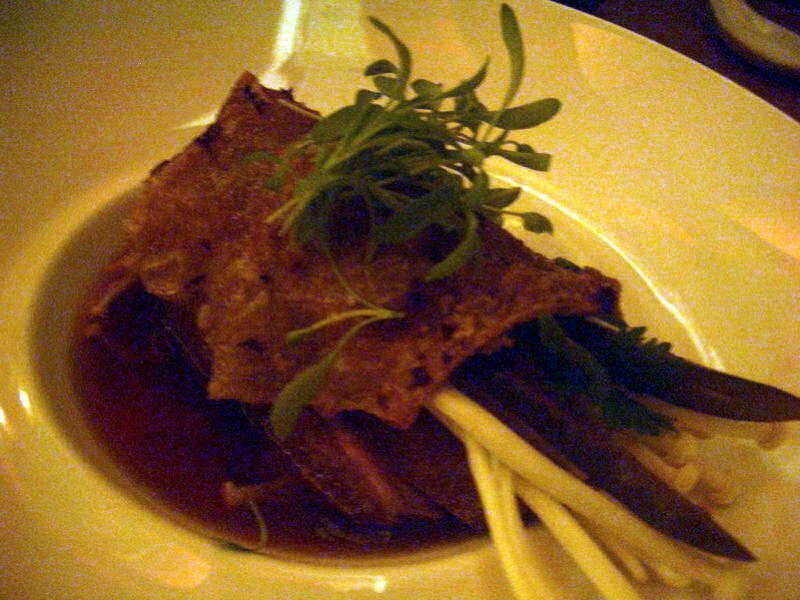 The other entree was rare duck with pickled chillies wrapped in crispy chicken skin ($16). Our waiter had nodded sagely as we ordered it, saying he thought it was the best thing on the menu. Boy, was it good. I've always loved rare duck, but mixed in with the enoki mushrooms and tangy/spicy pickled chillies? Under a sheet of naughty naughty crispy chicken skin? Sensational. I will definitely order this one again next time I'm there. 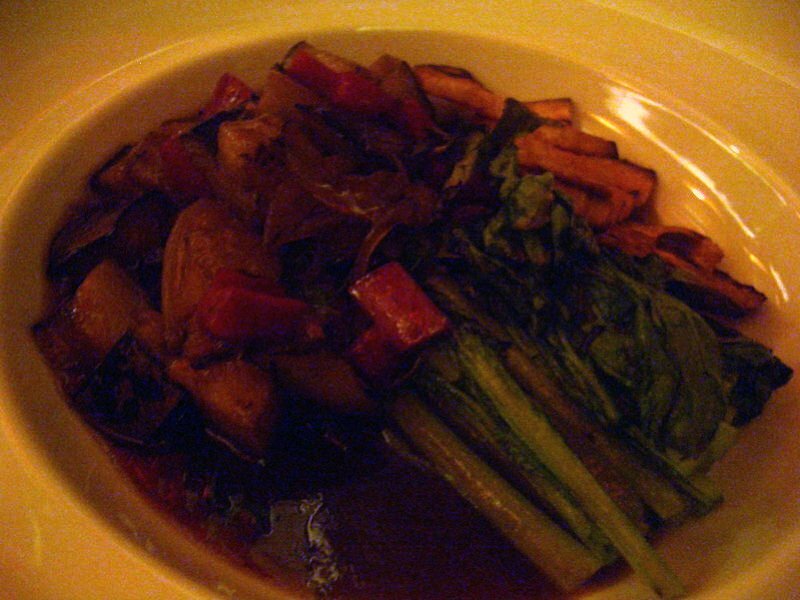 We decided we wanted one of our mains to be chock-full of veggies - this is the Yu Xiang eggplant with grilled vegetables ($20). Less showy than the duck and the fish, but it had great, clean flavours, and there was plenty of sauce underneath that we could mop up with our rice. 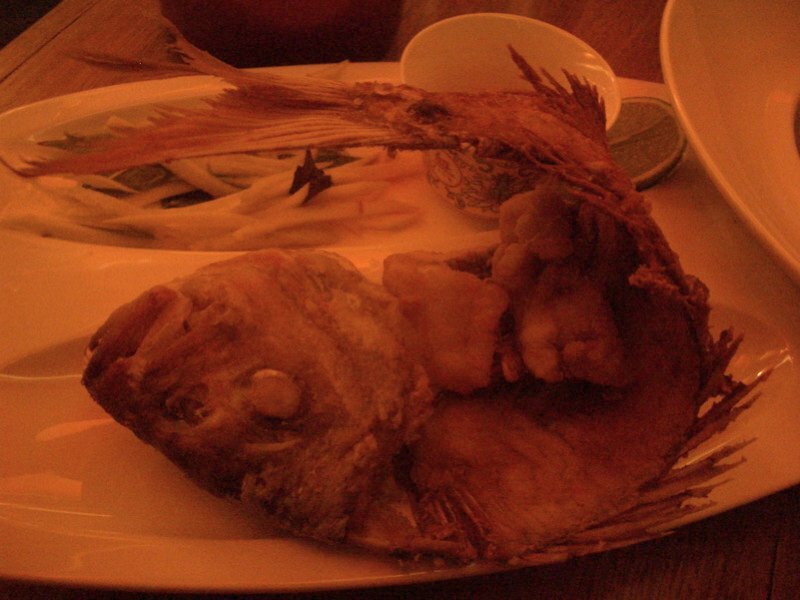 The previous dishes were all well and good, but this fish was definitely the show-stopper. 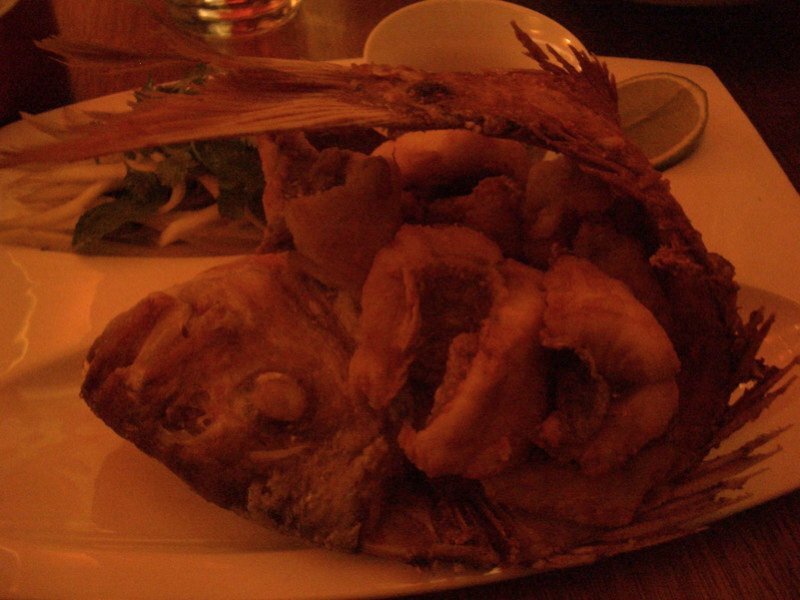 Crispy fried whole snapper with tangy green mango salad ($32, I think). Although it was superficially similar to a crispy barra I had a few months ago at Longrain, the Seamstress version was better - the flesh was moister, the batter was lighter, the presentation was more spectacular. The green mango salad was really moreish - wish they'd also offer it as a side salad! The fish with a few of the pieces missing, so you can see the salad and the fish spine better. There was still good flesh to be had on the spine (and the cheeks, of course). Our one complaint relates to the wine list. The list we were presented with was slightly different to the one you see on their (understated, yet stylish) website in that there wasn't a single pinot noir for under $50 a bottle (unless you count the $28 "cheeky half", which of course turned out to be a measly little 375mL half bottle). The week before my first post-Xmas payday (damn you, monthly salary!) money was rather limited, and it was frustrating that all the wines were so pricey relative to the food prices. Maybe I'm a philistine (or maybe I'm a a snob), but I just don't like to drink complex wines when eating highly spiced Asian food - I save those wines for French or Italian (or Japanese) meals. Of course I can understand that co-owning your first restaurant and having total freedom over the wine list must be an exciting prospect, but I feel there ought to be a few wines at the cheaper end of the spectrum, eh? 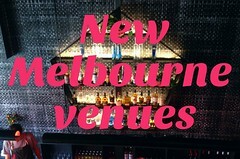 And yes, the top floor cocktail bar is indeed really nice - my new favourite city bar. My photo REALLY doesn't do it justice, so look at these pics here and here. C'est cool, n'est-ce pas? 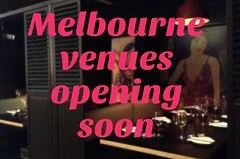 Good to hear about another new, recommended bar in the city. 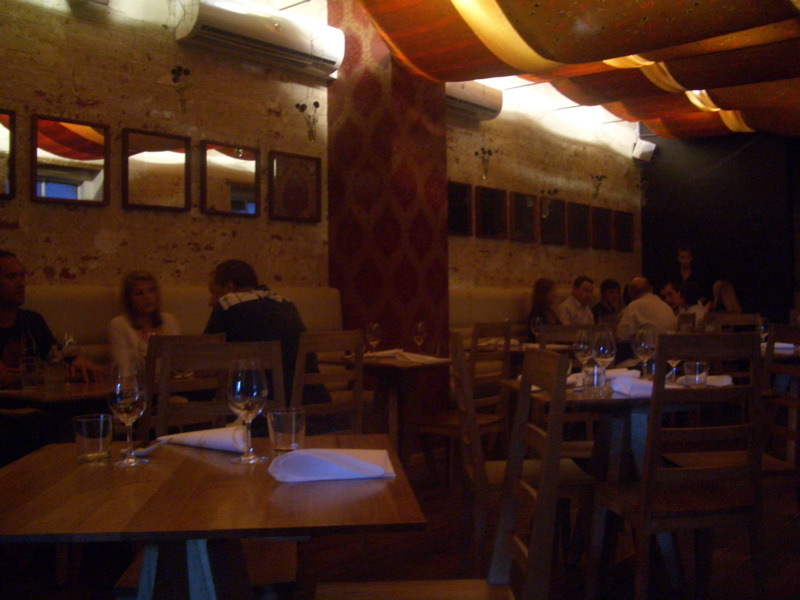 I struggled with the dim lighting in there too! We didn't wander up to the cocktail bar, but it sounds fab. Happy belated birthday! That rare duck dish sounds unbelievable. I may need to visit for that alone!